Although the 1998 MGS image made the "Face" look less face-like, it actually threw up new facial features that weren't apparent in the Viking images from 1976. The "pupil/iris" feature on the West side of the "Face" was confirmed, although the "eye socket" was difficult to make out through the murk. Although foreshortened, the "eye socket" on the East side of the "Face" was also confirmed. The ridge line of the "nose" was also more pronounced and a new feature was seen. The "nose" ended with a pair of cat-like "nostrils". (This article will deal with the feline nature of the "Face" below). There also appeared to be the remains of "lips" on the western side of the "mouth". Another interesting new feature was that the south-eastern most end of the "Face" platform had collapsed downward to form a trench lower than ground level (see picture below). 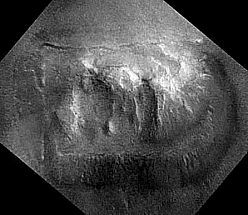 This kind of "moating" caused by apparent subsidence is a feature of other Cydonia anomalies such as the East Formation µµµ and the Fort µµµ. Cydonia Quest has suggested that such subsidence is the result of the collapse of artificial underground spaces. Shortly after the publication of the 1998 MGS image of the "Face" Dr. Mark Carlotto made a rough-and-ready attempt to rectify the distortion cause by the extremely oblique angle at which it had been imaged. A reduced version of this rectified image is shown below-right. It did make the eastern side of the "Face" look more face-like. However, it appeared to create new distortions in other parts of the image. In particular there appeared to be a diagonal distortion across the image. There is an interesting slide-show µµµ and article µµµ to be found on Dr. Carlotto's website on the facial and "architectural" features that are evident in the 1998 "Face" image. 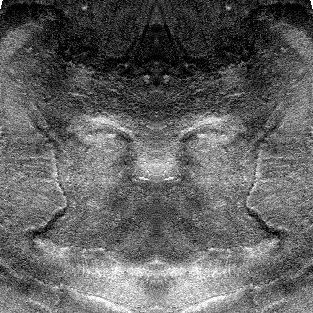 There is also an exhaustive five part analysis of the 1998 "Face" image on Mike Bara's website which can be read by clicking this "stargate" µµµ. This article includes amusing proof that the "nostrils" on the "Face" really are like those of a cat. Using a method known as Maximum Entropy Deconvolution, which reclaims lost data from compressed images, the Enterprise Mission has been able to show that the areas of the "Face" around the "nose" area may have a honeycomb structure, (click here µµµ). This may be indicative of an exposed and eroded artificial support structure within the "Face's" interior. Now Cydonia Quest doesn't have such advanced software, but I've been independently enlarging and contrast stretching parts of the "Face". This exercise has revealed a lot of grid like high-lighting around the "nose", and around and within the "mouth". I suspect it was the light catching these features in a certain way that gave the impression of "teeth" in some enhancements of the Viking images. The best chance of collecting evidence for possible structural details in the "Face" seems to rely on getting very clear, high resolution images of the "nose" and "mouth" areas. So. Is it a Face ? There are a lot of reasons for thinking that the "Face" formation may be artificial. 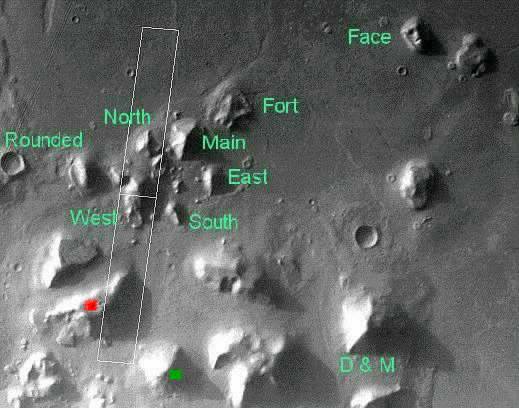 There is the almost geometric precision of the platform's footprint on the Cydonia plain. There is the way the top edge of the platform is a consistent height all around its perimeter. There is the way in which the eastern and western sides of the platform run parallel with one another. This parallel aspect is also shared by the top and bottom edges of the platform's slanted sides - an aspect that is particularly precise on the western side. In addition there are the mysterious straight grooves across the northern slope of the "Face" platform. However, the proposition that the central parts of the "Face" formation actually constitute the remains of a deliberately sculpted face is "not a done deal". Even at the time that the high Sun angle Viking picture was discovered it was apparent that there was something wrong with the "Face". The eastern side of it was a different face than the western side, with a different shape and a different mouth. It could have been argued that subsidence and erosion accounted for these differences. However, there was no way of avoiding the fact that the "eye" on the western side was higher up on the face than that on the eastern side. The two sides of the perceived face could never have been symmetrical. No! It isn't? 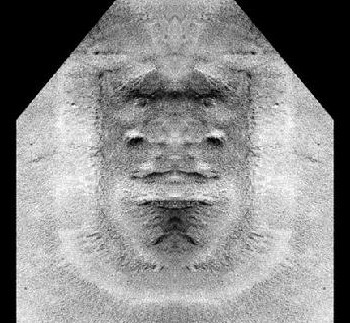 Before MGS arrived at Mars I would sometimes look at the pictures of the "Face" in the Monuments of Mars in a different way. Was it possible that the "Face" was really an artificial platform with the remains of a ruined mound system on it. We can explore this idea by turning the 1998 MGS image of the "Face" on its side, (see left). The central features now look like a possible arcology that has collapsed in on itself. The parallel ridges running down towards us in this image could be the remains of the major support structures within such an arcology - although they could equally be the support structures for a gigantic sculpture. (I should mention at this stage that my own position in the Spring of 2001, is that if the "Face" is artificial then the facial features were intended). One person who has argued as far back as 1998 for the above proposition is Martin Keitel. Some of his work is relevant to the way this study developed. His website suddenly disappeared in 1999, but only today, as I was writing this section, a regular poster to TEM's message board posted a link to it under a new web address. Even more surprising was that the link was to a new piece of work that was entirely relevant to this section. (This leads me to propose the following essay title - "Synchronicity; does it exist. Discuss"). Keitel has constructed a 3-D fly around animation of the 1998 image. As one watches, it is not too difficult to imagine the "Face" as an arcology where there has been massive inward collapse on the western side, (click on the following "stargate" to see Martin Keitel's animation µµµ). It would of course be a delicious irony if the face that drew us to the Cydonia anomalies in the first place was an accidental effect. Readers of Richard Hoagland's The Monuments of Mars will know that he made an ingenious suggestion for why the two sides of the face on the "Face" platform were not symmetrical. When the two sides of the "Face" in the Viking image were separately mirrored, they produced the faces of an ape-man and something that looked like that of a lion. Now to many people this will look like special pleading. It is also the case that if this effect was due to intended design then it makes it more difficult to show that the "Face" is artificial. A symmetrical face would have added weight to the argument that the "Face" is constructed, as such near perfect symmetry would be unlikely to have occurred by chance erosion. It is interesting that this ape-man/lion effect works even better with the MGS image than it does with the Viking one. Many web-sites attempted this with the MGS image in 1998, but only Martin Keitel's version both sliced the "Face" in half properly and also made the image negative to replicate the Sun angle coming down from the top of the head. In preparing this article memories of Keitel's work inspired me to create my own versions of the "Ape-man" and "Lion". As can be seen the two sides of the "Face" are strongly facial - even if they are from different faces! Now that Keitel's website has been found again the reader can also view his versions by clicking on the next "stargate" µµµ. Another ugly mug? In considering whether the "Face" was an artificial construct intended to attract Humanity's attention when we achieved space travel, Carl Sagan made the following interesting objection. Why only one face? An arrangement such as three identical faces in an equilateral triangle would have given us an unambiguous signal of intelligent intent. This is a good point that we will return to below. However, the 1998 MGS image strip of the "Face" also revealed some facial features on the mesa that lies halfway between the "Face" and the D&M Pyramid. The position of the relevant formation can be seen on a Viking context picture of Cydonia by clicking on the following "stargate", µµµ. The images below show the relevant mesa on the left and a mirrored image of the "facial" features on the right. For obvious reasons this formation has stuck in my mind as the "Half-Face" mesa. The Enterprise Mission made a great fuss of the "Half-Face" way back in 1998. A bigger and clearer picture of it can be found at their website by clicking on this "stargate" µµµ. Whereas the top of the head in the "Face" is aligned in a northerly direction, the "Half-Face" is aligned in a westerly direction towards the "City". Although there is a very well defined "eye" and most of a "nose", there isn't really any hint of a mouth in this 1998 image (which suffers from all the murky problems set out in Part One). It can be seen that the top of the "Half-Face's" head has been carried away by a landslide. If the "Half-Face" is an artificial sculpture then this may have destroyed important evidence. 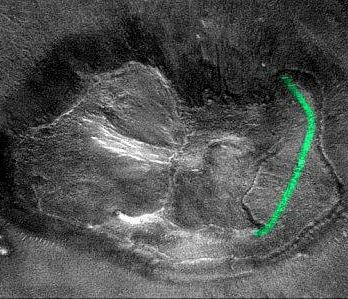 The green line that I've drawn on the image marks the faint outer boundary of the "Half-Face", which exhibits a similar kind of shape to the outer boundary of the "Face" platform. The mesa on which the "Half-Face" sits looks like it is a natural flat topped geological formation, although it may have undergone alteration. It may be that the "Half-Face" represents a sculpture of a face that was under construction, but was never completed. There is something like the "ruins" of a gigantic ramp sloping up to the "nose" from the non-facial side of the mesa. This ramp shows up as a particularly bright feature on the image above. It may have been used to haul up building materials and then intended for use as a support structure for the uncompleted side of the face. It is an interesting co-incidence that there should be the "ruins" of another possible face sculpture right next door to the "Face". Even though the Human brain is exceptionally well programmed to pick out faces in practically anything, the existence of the "Half-Face" increases the chances that if the "Face" is artificial, then it was indeed intended to look like a face. The disappointing aspect of the "Half-Face" is that although it corresponds to the "Lion" side of the "Face" it does not bear a striking resemblance to it - as can be seen by comparing the mirrored image of the "Half-Face" above with the "Lion". 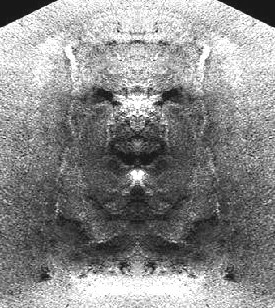 The mirrored "Half-Face" looks like a cross between a lion, a bull and "uncle" Joe Stalin! If the facial features of the "Half-Face" had exactly replicated those on the "Lion" side of the "Face", then this would have been very strong evidence that both these formations are artificial. Danger! Danger! Will Robinson. Warning! Warning! Rampant speculation approaches this way! If we drop our defences for a moment and accept that the "Face" is a morphed sculpture between an ape-man and a lion, then this raises questions that are potentially much more disturbing than the ruins of ancient colonies being found on Mars. For both ape-men and lions are Earth creatures and there seems to be no reason why extraterrestrial colonists should have built such a structure. One conclusion that can be drawn about the "Face's" mismatched left and right sides is that it was not built to attract our attention like the fictional Tycho Magnetic Anomaly in 2001: A Space Odyssey. If that was the intention it would have been more logical to build a perfectly symmetrical "Face". Moreover, as Carl Sagan pointed out a geometric grouping of identical faces would have been even more compelling. Therefore, a more likely scenario is that the "Face" was built to satisfy the needs of the builders. I suspect that the hominid/feline nature of the "Face" was a major factor in Richard Hoagland's current line of theory that the Cydonia "monuments" were built by an earlier advanced human civilisation that was completely destroyed in some unimaginably catastrophic disaster thousands of years ago. Regular readers of the Enterprise Mission will know that Hoagland has drawn all kinds of disturbing implications from such a scenario, so I won't go into them in detail here. Needless to say they centre around the possibility that such a hypothetical catastrophe could very well happen again. 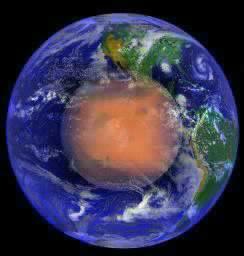 However, I suspect most people would attribute an extraterrestrial origin to the hypothetical builders of the "Face". So why on Earth (or Mars) would they incorporate a lion or an ape-man into their "Face" sculpture? Why not alien animals? One possibility is that the "Face" is much younger than it looks and that although it was built by aliens, its design was chosen by humans that the aliens were in contact with. This would be a scenario consistent with Robert Temple's investigative book The Sirius Mystery. There is, however, another much more credible explanation. This is that the "Lion" is not a lion at all. In this hypothesis what we take for feline features is actually the face of the extraterrestrial builders of the "Face". If the "Face" does turn out to be an artificial sculpture, just what were these hypothetical aliens commemorating in a morphed ape-man/alien face? The following possibilities have occurred to me, although they are not entirely mutually exclusive. n The morphed face was intended to celebrate friendly intentions by the aliens towards humanity: a symbolic recognition that in some way we had a shared future. n The aliens were imperialists and the morphed face was their way of proclaiming in a symbolic way their ownership of the human race. This is not a very comforting thought if they should ever return our way again. n The most disturbing possibility is that the morphed features of the "Face" celebrate a project that means that there is more of the alien in us than we would care to consider. This is the 2001: A Space Odyssey scenario in which our ancestors have been genetically manipulated to mould us into a form of intelligence in the aliens own "image". This hypothesis is very disturbing at many levels. Firstly, it would not do much for humanity's self esteem to discover that it did not pull itself up by its own evolutionary bootstraps. Secondly, there would be a paranoid fear that we were not masters of our own destiny - and in Arthur C.Clarke's novel we weren't. Thirdly, such a discovery could give a boost to the nasty politics of racial supremacy amongst humans. In 1950 William Dudley Pelley, America's would be "Hitler" µµµ, published Star Guests in which he claimed the human race was the result of interbreeding between advanced aliens and ape-men. He further claimed that this union of "half-god, half-human progeny" is symbolised by the Egyptian Sphinx. Of course in Pelley's hateful universe some races have retained the god-like genes better than others. Similar ideas are not uncommon in certain esoteric circles today. They could spread like cancer if it was shown that humans are the result of alien genetic engineering. Even if there wasn't an increase in the politics of racial superiority, governments may decide that if the aliens were able to create a superior species through genetic engineering, why shouldn't they continue the process? The idea of governments competing against one another to create a Super Race has sinister connotations. ........but let's leave all this unsettling speculation for the future. We have have yet to discover conclusively whether the "Face" is even an artificial structure. Nearly three years after the MGS had taken its picture of the "Face" it looked like this would be the only look at it we would get. Then in early 2001 (Richard Hoagland's "year of disclosure") things began to move again. To read of these further developments click the "stargate" for Part Three below.